I've never been to the Fringe Festival (the Midwest's largest performing arts festival) before this year. This may seem strange coming from a theater geek like myself, but I've found the huge list of shows to be overwhelming. How do you know what to see? But this year I decided to just pick a few shows and go. I have a five-show Fringe marathon day planned for next weekend, but after I ordered my tickets I kept hearing about other shows that sounded interesting. So it's ending up to be more than just one day (as it should). Next year I'm definitely getting a ten-show pass (or two!). The first additional show that piqued my interest is The Duties and Responsibilities of Being a Sidekick. I saw a postcard for it at the Theatre Garage when I was there for Girl Friday's Street Scene last week. I couldn't resist the idea of the talented and hilarious Randy Reyes playing a superhero sidekick. And it lived up to my expectations: funny, quirky, and entertaining. 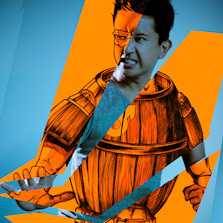 Randy plays Barrel Man, sidekick to the superhero Gentleman Li. As Barrel Man complains to his sidekick friends, the sidekick does all the work and gets none of the credit. The scene of the super-friends commiserating about the super-life was a little Dr. Horrible-esque (which is a very good thing in my book). As with most superheroes, Barrel Man's alter ego Justin is not quite as confident as his super-self. Justin has a crush on the girl at the coffee shop, Isa, and in scenes of painfully hilarious awkwardness, he's unable to tell her how he feels. But with the help of his friends Jack (aka Paso Doble, dressed just how you'd think) and Jill (who transforms into the delightful Fruit Fly in white go-go boots), Justin finally gets up the nerve to walk Isa home. When they're attacked by a mugger, Justin defends them and has things under control, until Gentleman Li arrives and manages to make a mess of things while simultaneously impressing Isa. But in an interesting turn of events, Isa is not who she seems to be either, and her motives for fawning over Gentleman Li are something other than romantic. The play was written by Eric "Pogi" Sumangil, founder of the Barkada Theater Project (and sadistic dentist to Randy's Seymour in Mu's Little Shop of Horrors earlier this year). The cast is great, especially Jason Michael Vogen and Katie Bradley as the sidekicks. There are some pretty impressive fight scenes (choreographed by Pogi and Allen Malisci, who also plays Gentleman Li), including some slow-mo punches. The Duties and Responsibilities of Being a Sidekick is a "super" fun show and a great choice for my first Fringe Fest show!